Pb as well as phosphate and ammonium. The retained pollutants then can be disposed of easily, legally managed safely with certainty for the end client. Unlike with all green suds, the 3P Filter Drain will not release metals once road salt solutions are introduced to the stormwater stream. This means stormwater draining from highly polluted roads, car parks, yards and industrial areas, can be completely treated directly on site and can be drained away or discharged to surface water. An appropriate Mitigation Indice would be 0.9. Channel Filter from 3P is DiBT certified. 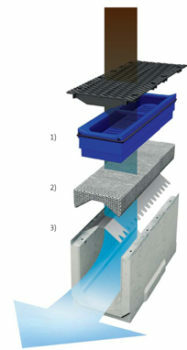 Modular designed unit for ecological linear drainage based on a standard D300mm channel width. Planners and designers do not have to make significant alternations to the drainage layout if they want to treat the water on site with the space saving Hydro Filter Drainage channels. This makes it an ideal retro-fit option on many sites. Waters can discharge to a green swale or other green infrastructure SuDS option. The sedimentation box removes coarse TSS solids such as stones, leaves and suspended particles. The rubber gasket ensures a water tight seal is maintained – ensuring waters pass to the subsequent fine filtration stage. Finer TSS (0 to 200 microns) are removed at this stage. The pre-treated rainwater then passes through the granular-filter-pad where the organic and inorganic pollutants are permanently removed from the stormwater. The filtered water flows over the plastic supporting baffle into the free flow area of the channel. The water can then be reused or discharged to surface or ground water via infiltration. If you require further information on our Stormwater products please contact us or call us on 01239 623506. These units pass the DiBT standard, as refenced in the CIRIA SuDS manual (see Ch 14 Part D: Technical Detail, and Ch 26, Part E: Supporting Guidance) and meeting a certain performance standard that will be understood and accepted by the EA in England.